Copyright © 2005 by Colin MacKellar. The Manned Space Flight Network antennas operated in the S-Band, on frequencies around 2.2 GHz. The system employed was known as the "Unified S-Band System" (USB). This system combined tracking and ranging; command, voice and television into a single antenna. S-Band frequencies were minimally attenuated by the Earth's atmosphere and were suitable for both Earth orbit and Lunar use. A USB-equipped antenna could transmit and receive simultaneously. Voice, telemetry and television were all received together. From the Lunar Module, for example, slow-scan television was frequency modulated on the carrier, and telemetry was phase modulated on the subcarriers. In addition, the system allowed for very accurate ranging to determine the distance of the spacecraft from Earth. "JPL developed the Block III Receiver Exciter and Mark I ranging system. Collins Radio developed nearly all of the remainder of the USB system. Note that SP-87 [see below] covers much more than the Unified S-Band System, which encompassed Antenna Servo, the Antenna Position Programmer, The tracking Data Processor, the Timing system, and the SDDS [Signal Data Demodulation System]. The 26-meter antennas were Blaw-Knox. The 9-meter antennas were developed by Collins. Collins Radio was also the prime contractor for installing all equipment. The Power Amplifier was designed and built by Energy Systems. Of course Goddard Space Flight Center was the prime NASA Center because they ran the Mercury and Gemini networks. All-in-all a large number of contractors were involved in getting the Apollo Manned Space Flight Network up and running." 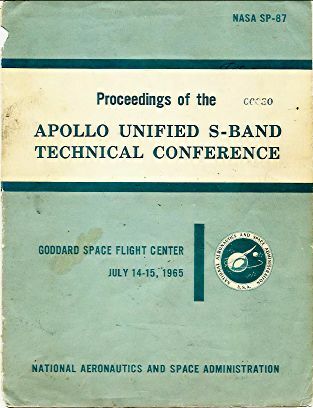 Proceedings of the Apollo Unified S-Band Conference, July 1965. In July 1965, the Goddard Space Flight Center hosted the Apollo Unified S-Band Technical Conference. The proceedings were published in this famous Unified S-band 'green book', NASA SP-87. Although some details changed before the first Apollo flights, this remains the most comprehensive record of the USB system. Bill Wood (ex-Goldstone) and Neil Sandford (ex-Honeysuckle) have worked together to produce this high quality PDF version of the book, NASA SP-87, from Neil's copy, numbered "00030". The document is a 27MB download. 316 pages.